Rembrandt Harmenszoon van Rijn (1606-1669), Belshazzar's Feast (c 1635-1638), oil on canvas, 167.6 x 209.2 cm, The National Gallery, London. Wikimedia Commons. The story of Belshazzar, his feast, and ultimate downfall is tucked away in the relative obscurity of the Book of Daniel, in the Old Testament, and to the best of my knowledge has only inspired four significant artists to portray it in paint. It presents an unusual problem for narrative painting, in that the story itself is about words – the same words that gave rise to the expression the writing is on the wall. It is therefore quite a literary narrative, and at first sight might not be a wise choice for a painting at all. The history books of the Old Testament are full of leaders who stray from God’s way, and come to an unpleasant end as a result. King Belshazzar was the son of Nebuchadnezzar, and like his father was the King of Babylon. Although Belshazzar was not wholly bad – he rewarded the prophet Daniel, for instance – he did not fear and respect God. Belshazzar threw a great feast for a thousand of his lords, and demanded that the holy vessels be brought from the Temple in Jerusalem for use at his feast – a very irreverent act. As the thousand lords raised their goblets to celebrate Belshazzar’s greatness, a hand appeared and wrote some Hebrew letters on the wall. Belshazzar called on his magicians and soothsayers to interpret the letters, but they could not. It was Belshazzar’s wife who suggested that Daniel be summoned. When he arrived, Belshazzar offered to make him third in rank in the kingdom if he could translate the Hebrew letters; although he refused the honour, Daniel translated. In doing so, he reminded Belshazzar of how God threw his father down until he learned subservience to God. Daniel pointed out that Belshazzar had been drinking from the Temple vessels but had not given honour to God. Accordingly God wrote the words mene, mene, tekel, parsin – translated and explicated as God has numbered the days of your kingdom and brought it to an end, you have been weighed and found wanting, and your kingdom is divided and given to the Medes and Persians. That night, Belshazzar was killed, and his kingdom passed to King Darius the Mede. 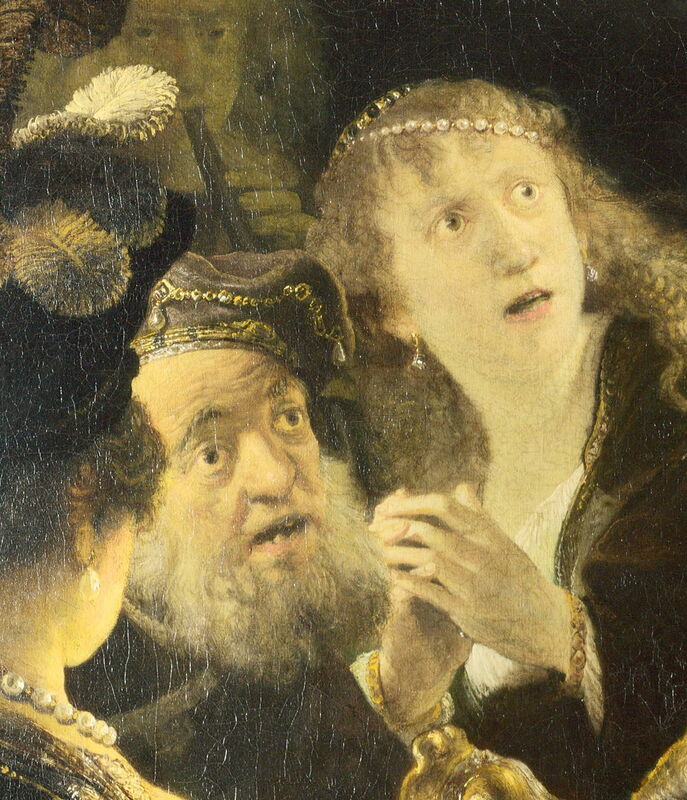 By far the best-known painting of Belshazzar’s Feast is of course Rembrandt’s, painted around 1635-1638. 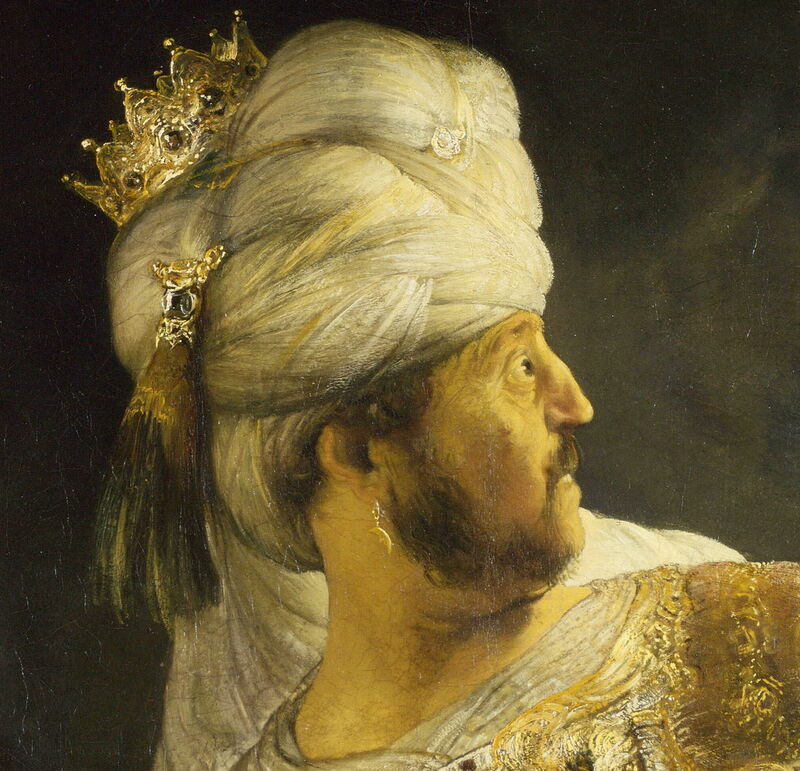 This is one of Rembrandt’s most beautiful paintings, in which he has captured the exquisite detail of the jewels and decorations on Belshazzar, and its rich, golden light shines across the room. Belshazzar is stood, taken aback to the point where his eyes appear to be popping out, as he watches the disembodied hand trace out the foreign letters on the wall behind him. His right hand is steadying him against a salver on the table, having knocked one of the Temple vessels over, his left hand is held up in amazement, as if to push the vision away from him. A couple of his guests sat to his right show astonishment, although the direction of their gaze is not actually at the writing on the wall. 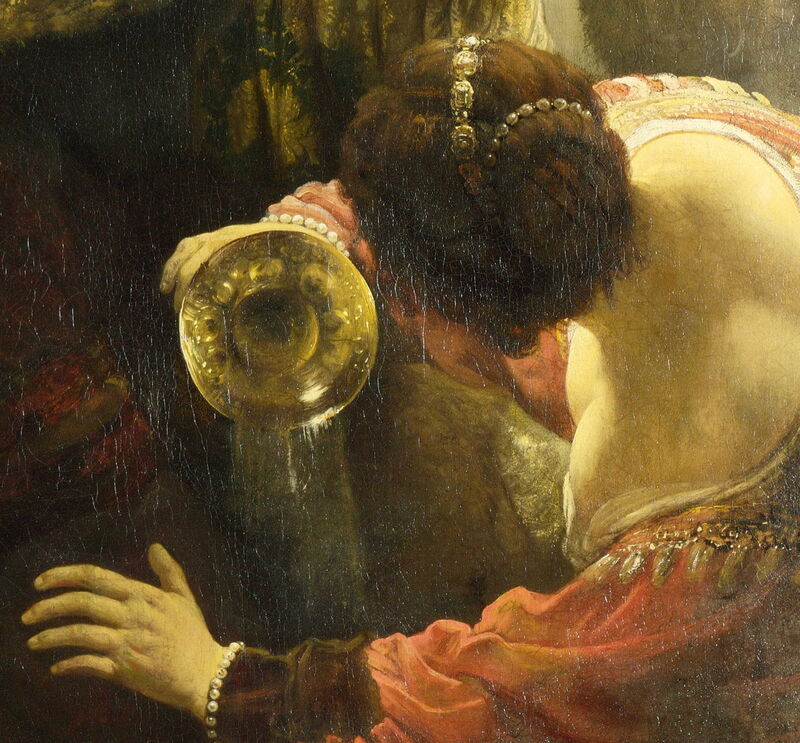 On Belshazzar’s left, a woman in a bright red robe is also transfixed by the writing on the wall, sufficient that she has tipped the contents of the goblet in her right hand onto the floor. There is, unfortunately, a problem with the Hebrew writing on the wall. Rembrandt is believed to have been advised by a friend who was a learned Rabbi, but one of the characters is incorrect, and they are arranged inappropriately in columns, rather than horizontally from right to left. In this early history painting of his, Rembrandt adheres rigorously to Alberti’s rules. The facial expressions are remarkably worked, and the body language even has wry touches of humour, with goblets being knocked over and tipped. His tight composition gives no impression of the scale and grandeur of the whole feast, but captures the moment of high drama. A little later, Pietro Dandini (1646-1712) painted his more modest version, which is now in the Pushkin Museum, and shown here. The English painter John Martin is best known for his apocalyptic visions expressed onto vast canvases. 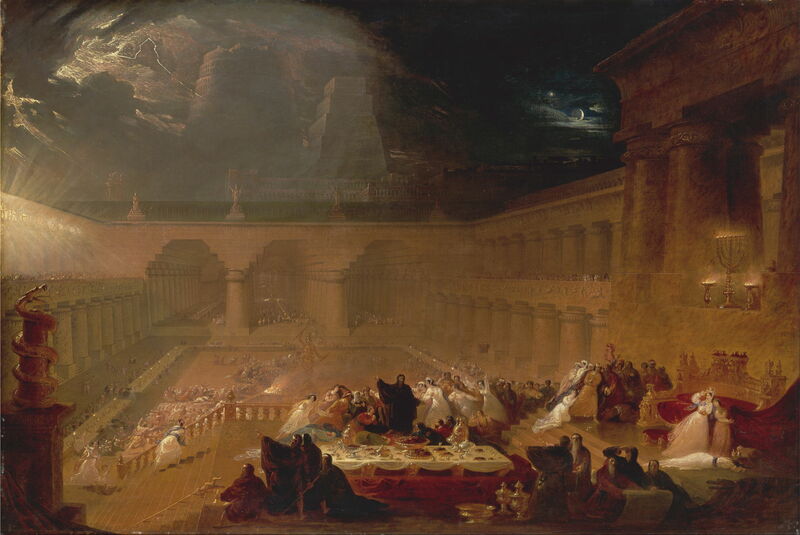 But following a challenge from his American artist friend Washington Allston (see below) before he left the UK in 1818, Martin painted three historical scenes from Babylon: The Fall of Babylon (1819), Belshazzar’s Feast (1820-1), and The Fall of Nineveh (1828). The version shown here is half-sized; the original full-size painting was offered to the National Gallery but declined because of its great size. Martin chooses a different moment in the story, and the other end of the scale as far as its pictorial scope. The thousand lords are shown feasting in vast open-roofed halls. Above them are the famous Hanging Gardens of Babylon, with the Tower of Babel in the distance, and a ziggurat slightly closer. 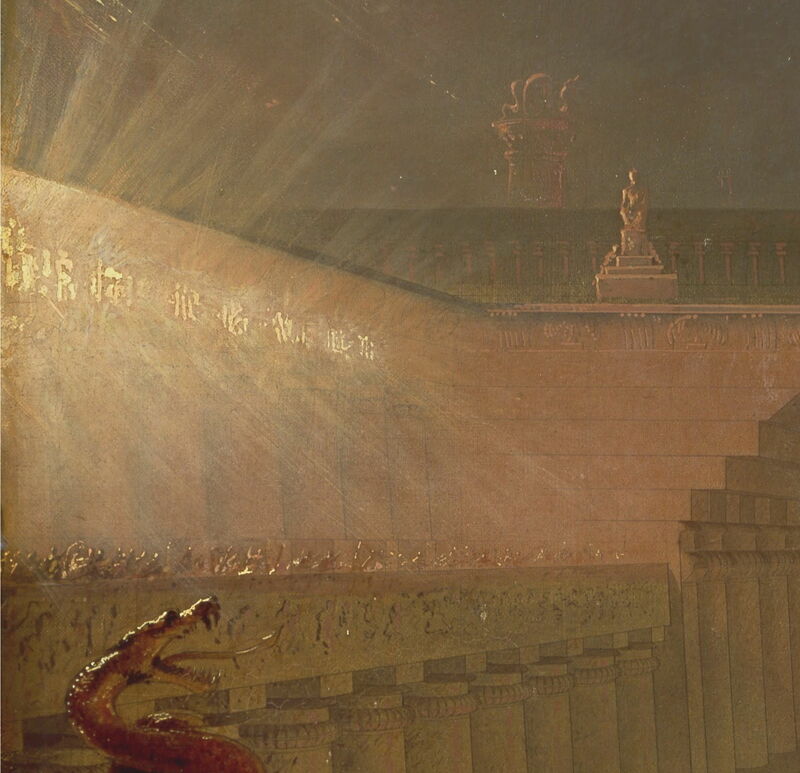 John Martin (1789–1854), Belshazzar’s Feast (detail) (1820), oil on canvas, 90.2 x 130.2 cm, Yale Center for British Art, New Haven, CT. Wikimedia Commons. The writing on the wall burns bright at the far left, its characters carefully made illegible in this version. The Top Tables are in the foreground, Daniel standing prominent in a black cloak explaining the meaning of the words. Belshazzar and his royal entourage are recoiling in shock around his throne at the far right. In going for the grandeur of the whole scene, Martin makes it more of a spectacle, but lacks the human element of the narrative. There are no facial expressions to be seen, and the body language is all but lost in the vast scale of the image and his canvas. Martin’s American friend Allston appears to have started work on his own version around 1817, whilst still in the UK, and did not complete it until about 1843. Although he also used a huge canvas, of over 3.5 by nearly 5 metres size, his approach attempts to capture the same human intimacy as Rembrandt. 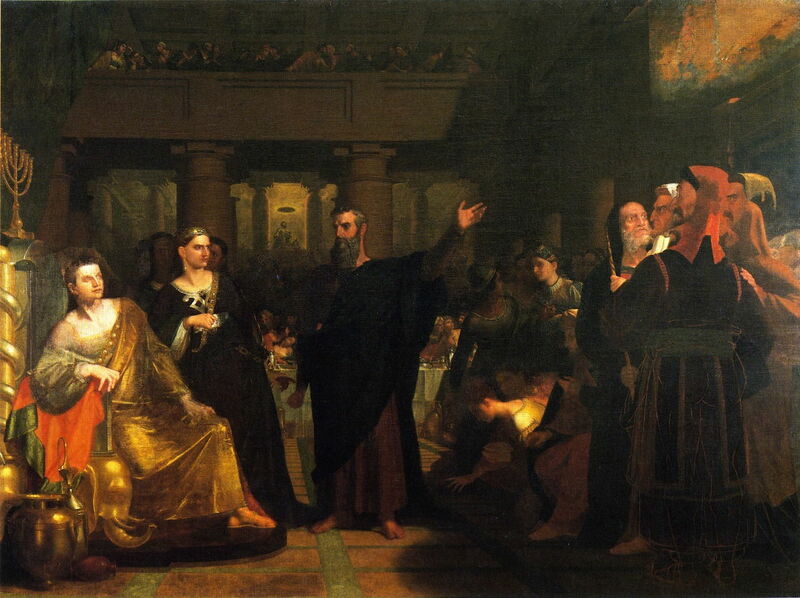 Washington Allston (1779-1843), Belshazzar’s Feast (1817/1843), oil on canvas, 366.1 x 488 cm, Detroit Institute of Arts, Detroit, MI. The Athenaeum. 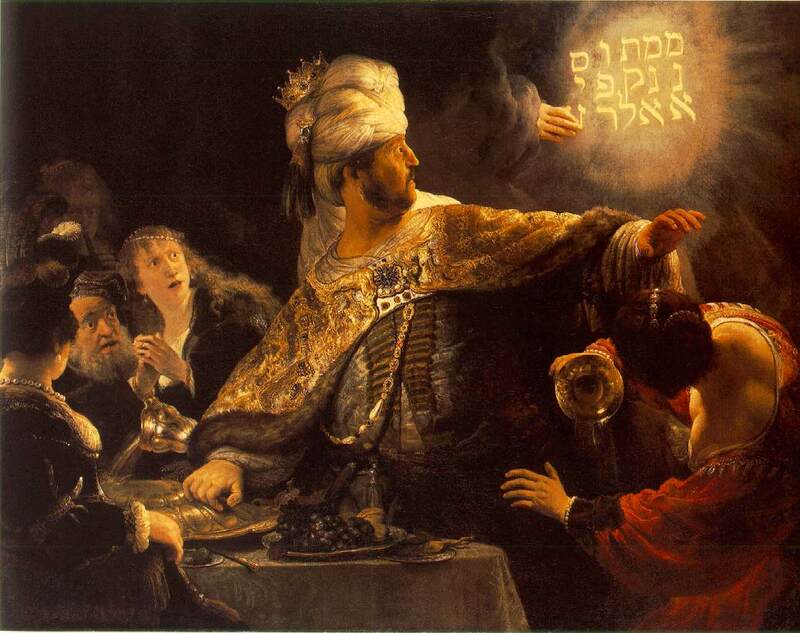 He shows Daniel, in the centre and dressed in black, explaining the meaning of the writing on the wall (off the right edge of the painting) to Belshazzar and his queen, at the left. The cluster of men seen at the right are presumably the magicians and soothsayers who failed to interpret the writing before Daniel was summoned. Although Allston does not manage the brilliance of Rembrandt, and loses Martin’s spectacle, he is able to show more of the facial expressions and body language of the people most involved. Most recently, Susan Hiller (born 1940) made a multimedia installation Belshazzar’s Feast, the Writing on Your Wall (1983-4), which is shown at the Tate Gallery. Its media are described as “sofa, armchairs, tables, pillows, lamps, artificial plants, rug, 12 works on paper, wallpaper and video”. The original account, with its now lost wordplay in Hebrew, still makes a good story, and was here depicted by three quite different artists with different approaches. Of the three, I still think that Rembrandt’s genius shines through, in a painting which is not only one of his most beautiful, but which expresses a very human and intimate account of the events. In going for the huge, awesome and spectacular, Martin loses the emotional appeal of the story. So too Allston’s version falls short. In the hands of masters like Rembrandt, telling stories in paintings can look deceptively easy: in truth it is not. Posted in General, Painting and tagged Allston, Babylon, Belshazzar, Daniel, Martin, narrative, painting, Rembrandt. Bookmark the permalink.